AWH Vortex has now has 2 wins in Get-of-Sire! Book your breedings now! AWH Vortex was the first line-breeding that we did. On the recommendation of Leslie Loveless (MacGyver's owner) and Dr. Brett Kaysen (professor at Colorado State) we embarked on an adventure we have not regretted. We bred AWH Flicka, our Belmonte grand-daughter out of Sierra Bonita's Sargent Pepper, back to her grandfather and got Vortex. Vortex is a blend of 2 strong traditions in US Suri: DDF Peruvian MacGyver, and Accoyo Belmonte. Vortex is studly and ready to carry on the grand tradition of his parents. 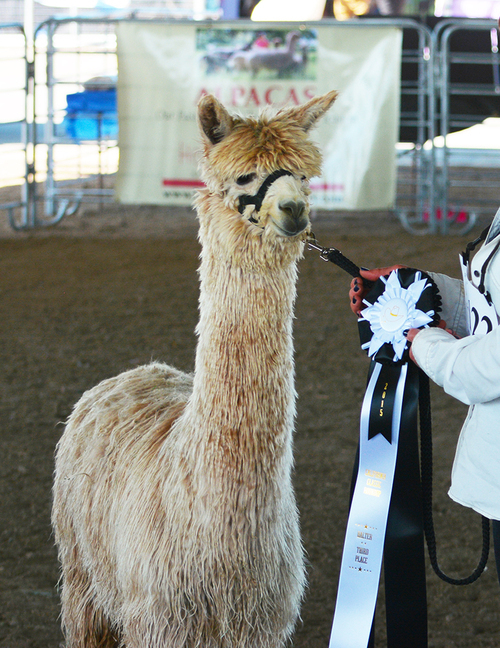 He has a very dense fleece, very fine, and continues to fall in the Top 1% of EPD traits according to AOA. His crias are stunning. 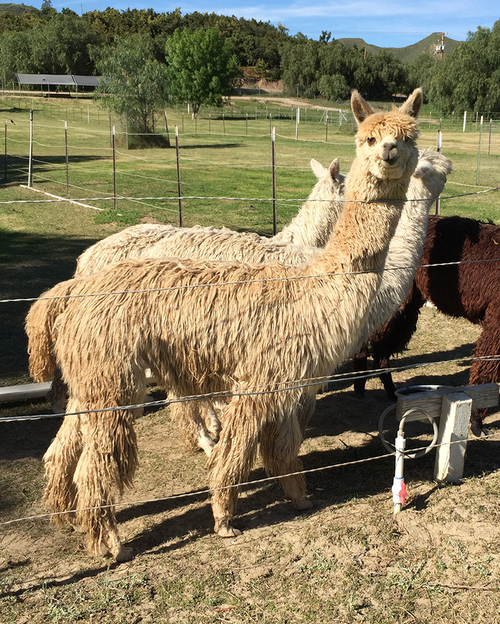 We recently sold his 2 oldest male crias as herdsire prospects, and we are keeping the youngest male, AWH Las Cruces by Vortex. Cruze is everything we have ever bred for in a suri. I have a feeling he will make a great mark on the suri population in future years. Let Vortex make his mark on your breeding program! Opportune Moment is the product of 2 champion parents: HCLA Opportunity & Gianni of PVA. 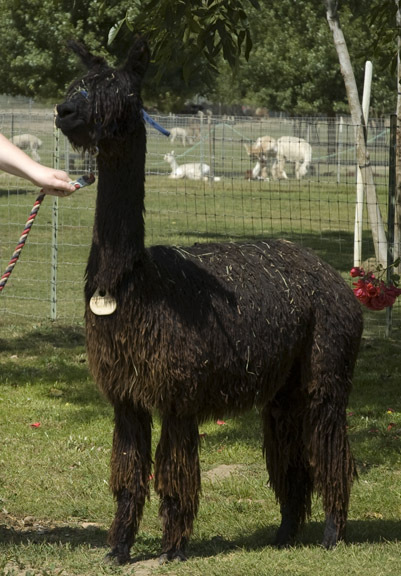 She carries deep color genetics and produces crias of unusual fineness in color. AWH Spiral of Silk by Vortex is a beautiful upright, shiny, silky girl. She really stands out in a crowd with her bright eyes and inquisitive nature. We had hoped she would produce black for us, but she only likes fawn, it seems. She also has not had any luck getting pregnant the 2nd time, so we've decided to let her be a pet female-- a rare occurrence here. She is really cute, up to adorable antics, and eats out of your hand. 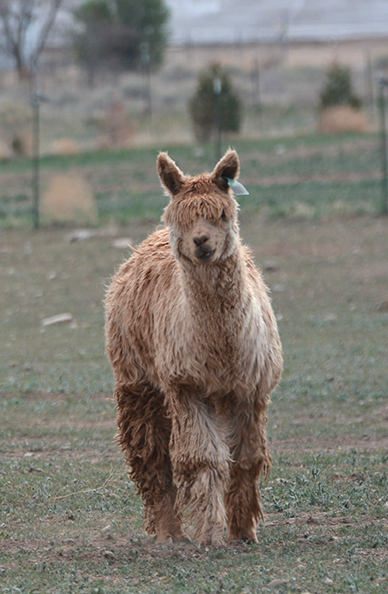 She is halter trained and should get friendlier and friendlier as the years go by. Come and get her--she's ready to go!